We offer both residential and commercial self storage services, units in both regular and climate controlled. Our facility is a self storage facility and located in the beautiful Northern Panhandle Florida. 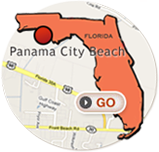 For your convenience we are located at 8224 Panama City Beach Parkway in Panama City Beach, Florida 32407.